MARLO WITHOUT TEARS began as a flip notion five years ago. My original plan was to prepare a salmagundi of previously published material by Marlo that was easy to do; to select methods which stressed subtlety and psychological cunning and required no difficult sleights. There is a neat irony here because such material is not associated with Marlo. The prevailing assumption about Marlovian magic focusses on its difficulties, complexities, and textual protraction. The look of his books are intimidating: pages of explanation, dense detail, allusions to other notes (published and unpublished), and diverting sub-texts. The beginner, to his dismay, soon discovers that Marlo is a detailist with an arrant streak to capture everything worth knowing, who has a fervor for absolute thoroughness to cover every contingency, possibility, and methodology. And this textual protraction and plethora causes newcomers, not knowing where to begin, to forestall starting at all; they seek an easier way. Simplification is an admirable goal, but careful writers are wary of it. Too often it leads to over-simplification, a dreaded intellectual sin, and simplifiers sometimes succeed in stripping away the very elements that make a trick subtle, sophisticated, and beautiful. The challenge of this book is a tough one. It tries to determine how to delimit explanations of complicated methods without sacrificing any substance; to find the imaginary line between "simple" and "simplistic" and between dull plainness and elemental elegance; to translate Marlo's distinct, stream-of-consciousness notes into a form that retains all of his finesse; to arrange his protean material into a format that reveals its scope, diversity, and uniqueness; to supply something for everybody, from the raw recruit to the seasoned veteran. 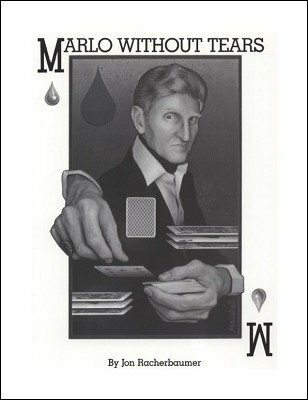 In short, this book is an attempt to allure Marlophobes into his special world of card magic. Marlo has yet to complete his creative adventure. His complete bibliography is still incomplete. So far he has contributed over 1500 items, over 56 books, and has written at least 3500 pages of text. This does not include reams of unpublished notes and correspondence. All in all, this astonishing prolificacy is extraordinary. We hope that MARLO WITHOUT TEARS will be a satisfactory and useful introduction to Marlo's oeuvre; that new students will become stimulated and enthused. In another article I wrote: "Marlo's work can be appreciated in part, but only becomes impressively formidable when investigated in toto. Raw recruits find the material too difficult. It must be read over and over until it is individually absorbed and organized so that its complex interrelatedness and developmental scope is understood." MARLO WITHOUT TEARS is not a primer, but its plain-speaking text will make matters as simple as possible. It may not spell out how and where to draw "the imaginary line between 'simple' and 'simplistic'", but it does provide many exemplary experiments along this line. Leipzig Would Have Loved This! Of Course I Can Deal A Good Poker Hand! 1st edition 1983, 317 pages; 1st digital edition 2016, PDF 297 pages. Publisher: D. Robbins & Co.